Why Buy Inferior Cord When You Can Get the Best 550lb Paracord For Less? – Ideal for Those Times You Need High-Quality Paracord, but Don’t Need 750lbs of Strength. – Great for Bracelets, Survival, Belts, Wrapping Tools, Lifting, Backpacking, Hanging Bear Bags and Towing Moderately Heavy Objects. Uses Limited ONLY by Your Imagination! – Measures 5/32″ OR 3.97mm (Outside Diameter.) Guaranteed Minimum 550lb Tensile Strength! – Key Mil-Spec Properties Include: Abrasion & UV Resistance, 30% Minimum Stretch, Pre-Shrunk, Color-Fastness, 100% Nylon, (8) Inner Triple-Strands and (1) ID Strand. Our Cord is Specially Constructed for U.S. Military Parachutes. Fits Great in Your EDC, Car, Tank, Backpack or Bug-Out Bag! American made quality by a company that has been supplying the US government with cordage for more than 100 years! Don’t accept cheap foreign imports or inferior cord… you just don’t have to! – Since our cord meets or exceeds the U.S. Military’s specifications, you’ll have more confidence if you ever need to use it. – Very easy to tie and untie, even after a heavy load. “PREMIUM CORD… AT A BARGAIN PRICE” NOTE: PACKAGED ACCORDING TO LENGTH. (50, 100 and 150 footers come coiled in bags, 200 footers on a tube and 500 and 1000 footers on a spool. 1000 footers may come in up-to 2 non-spliced sections. PLEASE SEE PACKAGING IMAGES ON LEFT.) Cord diameter measures 1/8″ (+/- 1/32″). For the times you need high-quality paracord, but don’t need 750lbs of strength, We want to be your “go-to” source for great type 3 mil-spec paracord. PEACE OF MIND. THERE’S NOTHING QUITE LIKE IT. Go ahead, make that paracord project. If you’re ever in a survival situation, you’ll be glad your bracelet, lanyard, etc. is made with high-quality cord. Our 100% Nylon (7 Triple-Strands) TOUGH-GRID cord is NEVER Spliced and is made with USA pride and craftsmanship which gives you that great feeling that you got what you paid for and are helping keep America strong. TOUGH AS NAILS WHILE SOFT AND FLEXIBLE Spending time in the outdoors is a great pastime, but can be dangerous. Safety and preparation are critical, especially for the young and old who are much more vulnerable to the elements. TOUGH-GRID Paracord gives you an excellent lifeline when your family needs some strong, lightweight cordage. You can enjoy the outdoors knowing you have the best 550 paracord around and that it’s ready when you are. 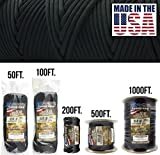 VETERAN RECOMMENDED Our paracord has hundreds of reviews from US Military Veterans like these: “They have mine and my family’s business for life” “GET SOME, see for yourself, Worth the Price” and “This is a Class A Product, It Will Save Your Life!! !,” Take it from the experts and change the way you camp, hike, survive and make paracord projects. Whether sheltering in place, stocking your bug-out bag, crafting, or surviving a zombie apocalypse, you’ll want enough Mil-Spec cord to cover anything. SEEMS LIKE A NO-BRAINER TO ME! Use our cord whenever you need super strong, light cordage. You’ll be ready for just about anything if you throw a roll in your trunk, keep a hank in your backpack and even in your tool box! We like the old saying “It’s better to have it and not need it than need it and not have it.” That sums-up the prepper / survivalist / Boy Scout spirit pretty well! When you’re in need of strong Genuine Military Grade Paracord, we’ve got you covered… Guaranteed!